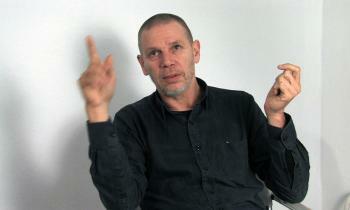 Roi Vaara is one of the most internationally recognized performance artists in Scandinavia. He was born in 1953 in Moss (Norway), but grew up in Helsinki, Finland, where he has caused constant controversy in the art world since the early 80s. His critical point of view is not to attract public sensation but to challenge the way we are looking at things. Vaara studied in the University of Art and Design in Helsinki (1972-75) and went on to study in Jyvaskyla University (1976-77). He is one of the founders of Muu ry (1987), an artist-run interdisciplinary association in Finland and is one of the founders of IAPAO (International Association of Performance Art Organizers) in Essen (2003). Vaara has organized and curated performance events such as "Poikkeustila", the first performance festival to gather artists from the whole of Finland together (1999). In 2001 Vaara organized the performance festival "EXIT" in Helsinki, which assembled about 300 artists from more than 30 countries. Vaara received a state award from the Arts Council of Finland in 2000 and the Ars Fennica prize in 2005. Vaara was selected in Kunstlerhaus Bethanien’s International Atelier Programm, Berlin, Germany (1997-1998). Vaara has made performance art since 1982 and from 1988 on, Vaara has participated in performances with the International group, Black Market International (BMI), whose works explore performance art as a simultaneous form of communication. Vaara has performed in performance art festivals around the world, in Kassel dokumenta, Germany (1993), Venice Biennal, Italy (2001, 2005), Havana Biennal (2004), and Manifesta 5, San Sebastian, Spain (2004). Until now Vaara has presented more than 300 different performances, that have taken place in over 200 international exhibititons/festivals in 35 countries. In 2005 his large body of work was collected and shown in his Ars Fennica retrospective in Amos Andersson Art Museum in Helsinki. Vaara lives in Helsinki. This Work, Roi Vaara, by elaa-girona is licensed under a CC BY-NC license.